Tonal Influences: What Thaitown in LA wants to duplicate. Over 10 years ago, I always wondered what the Thai restaurants in Thaitown were trying to duplicate. Some of them would have bands. 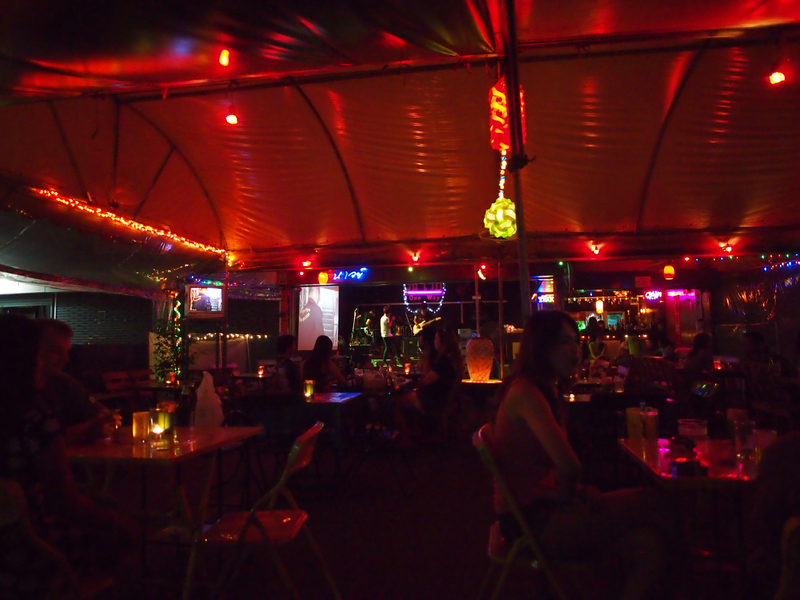 It is also where Thai Elvis plays. (Where that concept came from, I don't know.) Well, now I know. Bangkok is populated by several tiers of restaurants, and many of them do have music. The locals hang out at what I would like to describe as minimalist gastropubs. Generally, even if it is a bar, they will serve food, or get food for you. This differs heavily from the malls in Bangkok, where more high end food are situated. In this post, I'm going to examine this local scene. Open air with live bands. Many of these establishments follow this basic common denominator. 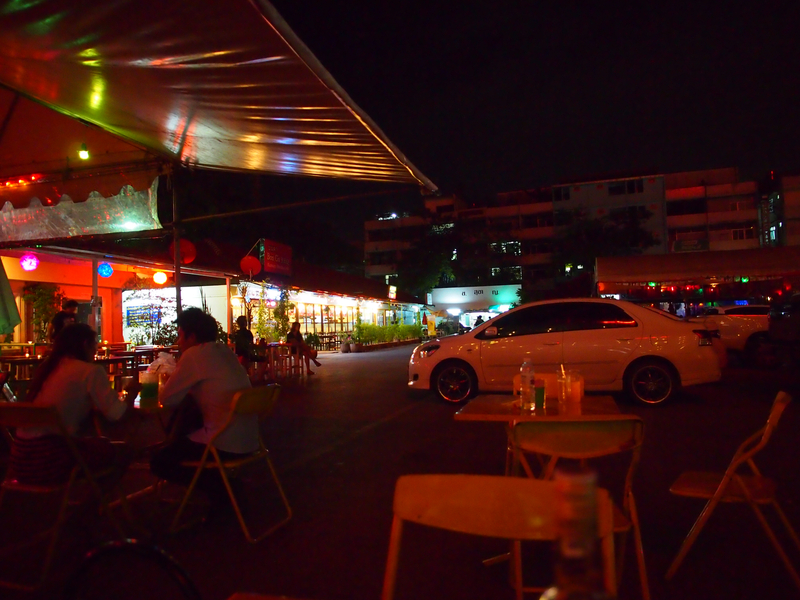 This is the parking lot of a standard local Thai restaurant area adjacent to 2 universities. If you want cheap but good Thai food, go to areas that are close to universities. They cater to the students, and they are generally cheap and probably better than what you would get in a sit down restaurant. 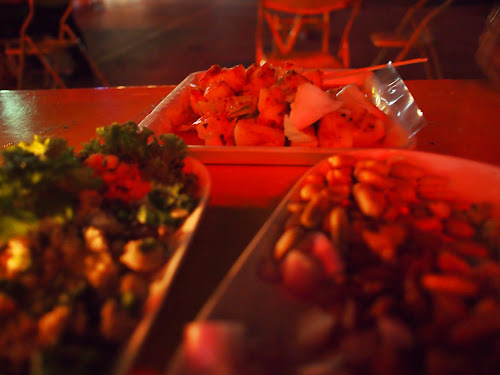 The street food scene in Bangkok is serious business. As you can tell, many of the restaurants will be open air with open air kitchens. Will it pass code in LA? Hell no. Does it taste better than LA? Hell yeah. Tables are set outside on a daily basis, and at the end of the day, which could be very late, they fold the chairs and wrap up. Because of the food police in Los Angeles, Thaitown is unable to create a set up like this one. Much of the food in Thaitown is largely emulates this scene. The outdoor setting of the original format makes sense in that Bangkok for the most part is very hot, humid. Overhead for AC and other features are minimal. In addition to the restaurant, there are often other street food venders close by. Many of these street vendors specialize in one item only. You can get an array of food like seafood salad, papaya salad and grilled fish and squid at almost unheard of prices. In fact, there are items on the street that are impossible to duplicate in Los Angeles. Many restaurants in LA do not have open air cooking areas. I picked up 3 dishes. The one on the left is chicken larb. The one on the right is a peanut combo with lemongrass, onions and other items that you mix together. The main event is in the back. Those chunks of white flesh goodness are grilled squid with a chili sauce. They grill the squid over coals. Usually the squid are only about 12 hours old, as they usually go from boat to market quickly. While driving through the countryside, you would see these trucks leaking water racing towards Bangkok. They were delivering squid and other seafood. That dish, which composed of about 2 large squid, cost about 70 baht. Basically, each dish was just over .60 cents USD. This entire spread was just under $6.00USD total. Beat that price McDonalds. Ironically, there are McDonalds in Thailand. A Sausage McMuffin combo is about $3.50 USD in terms of Thai baht. It's considered ironically to be a high end place. In a strange way, you get less food and play a higher rate. Costs in LA Thaitown versus Bangkok. These are proportionately higher. A single dish in the particular area of Bangkok that I am staying, near Ramkhamhaeng University has a large number of street venders. A dish may cost you on average about 35 to 110 baht. That is a range between just over a dollar to 3 dollars per plate. In Los Angeles, the average plate would begin around 5 to as high as 8 dollars. The costs for equivalent dishes would be proportionately twice the cost, but obviously, if you are in Bangkok, the authenticity is out of the discussion. Downside. Unless you know people, you may not necessarily know which street vender to go to. On the whole, you go where the crowd is. If there is a line, generally the locals deemed the food to be OK. Comparisons. When you compare LA's Thaitown with Bangkok, well . . . that's just not fair. The closest that they will get is the Songkran Festival, now that they shutdown the vendors by Wat Thai in North Hollywood. The vendors who frequent those events tend to have very specific and limited menu items. The food is different in Thailand. The vegetables are different. The eggs are different. Eggs in Thailand have a deep orange color. In some ways, the meat in the USA is better unless you consider ground beef recalls. Pork actually tastes like pork here. When you come here, focus on the areas by the universities. I'm in an area next to the Thai Sports Authority and Ramkhamhaeng University and Assumption University. Some good stuff here. And of course, the people are friendly.